The 2nd generation Ford-50 thermostat is made with the same exact components as your OEM unit, including a rubberized diaphragm, and is only available from Reische Performance. It's a direct-fit unit with proper bypass control so you're guaranteed maximum efficiency from your cooling system. No Chinese knock-offs here, this is the highest quality unit currently available for this application. 100% made in USA. This thermostat will provide the best possible heat dissipation from your setup and even deliver better overall performance than our competitor's 160° thermostats. 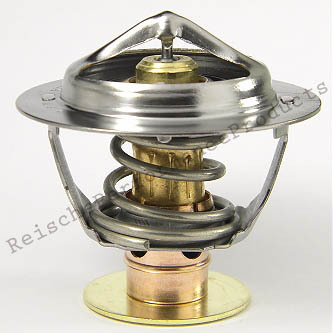 Reische believes the 170° opening temp is the ideal balance for high performance engines, providing high flow to your radiator by mid-180 temps while still providing good all season performance. With proper fan settings your coolant temps in cool weather will be in the 170s and in hot weather the 180s, giving those running high levels of timing and/or boost added protection against engine-damaging detonation as well as maximum hp.